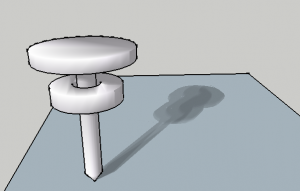 Soft Shadows is a tool in NprTools to create an image from SketchUp with softer shadows from the sun. This is accomplished by merging images with sun sun set to slsightly different dates and times. 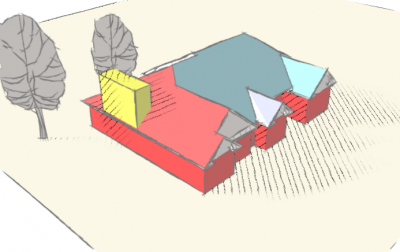 This is a SketchUp model using a Sketchy Style. However the shadows are too harsh. This is the same model processed by NprTools Soft Shadows. To get started, select a softness and coarseness below. Use Medium and Medium for your first trial - it will merge about 25 images. 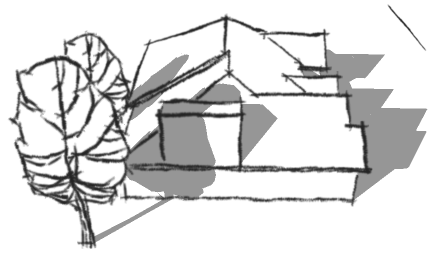 Sketchy Shadows do not work on the ground plane - you must have a face to cast Sketchy Shadows onto. Use other tabs for more advanced settings. Presets The Shadows Tab provides a set of presets for Softness and Width of the shadow images. Shadow Softness - None, Coarse, Medium, Smooth or Custom - sets number of iterations. Shadow Spread - Narrow, Medium, Wide or Custom - sets days and time to process. Soft Shadows - creates a soft shadow with a solid color. 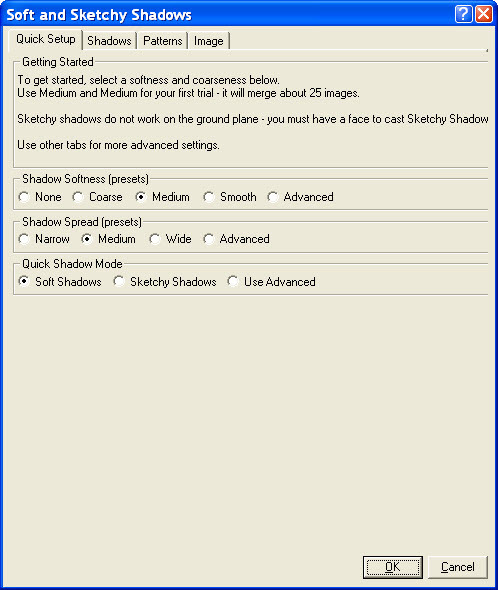 Use Advanced - uses advanced settings from the Shadows or Patterns Tab. Presets - see Quick Setup above. 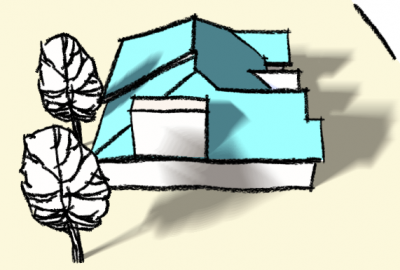 Shadows and surfaces in shade - all areas not in direct sun will be treated as shadowed areas. 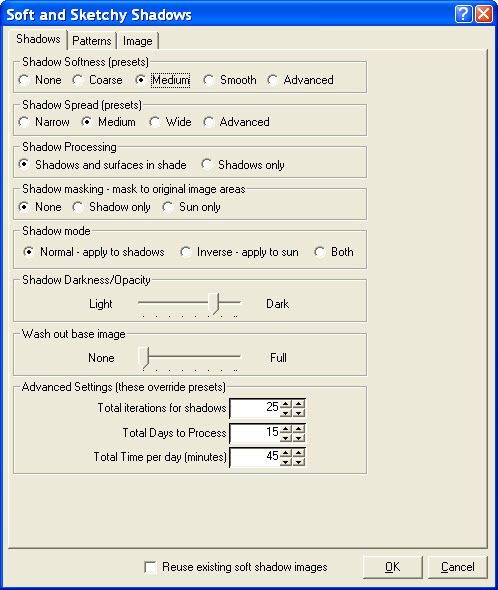 Shadows only - only areas which have full shadows when the sun is on will be processed. None - all shadows are merged to create the soft shadow image. 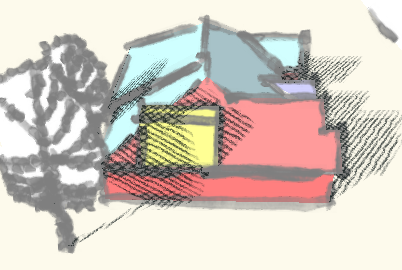 Will only soften shadows where shadows appear in original image. Sun Only - soft shadows are only processed in areas originally not in shadow. Inverse Shadow Mode. White hatch in sun, no hatch in shadows. Darkness/Opacity This changes the darkness of the shadows. the shadow pattern will be partially transparent, allowing the colors below it to bleed through. Wash out base image Makes the base image lighter, before applying the shadow texture. If you enter 5, then 25 ( 5 x 5) images will be blended - with 5 different dates and 5 different times. Date increment (days) - Number of days separation for each iteration. If set to 0, then date iterations will not be used. Time increment (minutes) - Number of minutes separation for each iteration. If set to 0, then time iterations will not be used. 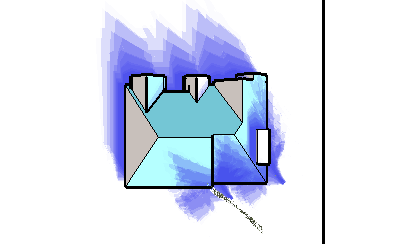 This, somewhat crude, image was created with 3 iterations (9 images), 2 days per iteration, and 30 minutes per iteration. 1 day per iteration, and 10 minutes per iteration. This image was created with 10 iterations (60 images - because date iteration was only 0.5), 0.5 day per iteration, and 5 minutes per iteration. Soft Shadows also works with watermark SketchUp styles. 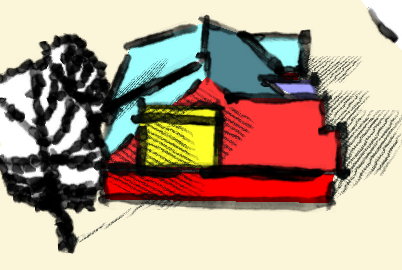 This image was made using the NrpTools Crayon style. The watermark mostly, only appears in the dark, (shadowed) areas of the model. All areas not in direct sunlight treated as in shadow. Only area darkened when sun it turned on treated as in shadow. Wall which is technically in the shadow of the sun, is not treated as a shadowed area. 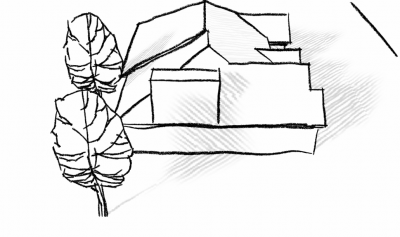 You can specify a Chipboard texture, or you can select an image to use as a texture. 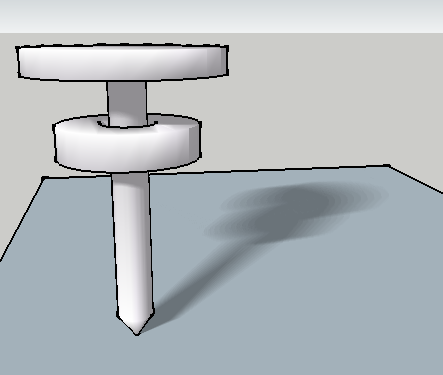 The texture image will be applied to the shadows directly, and not applied to the surfaces in your model. 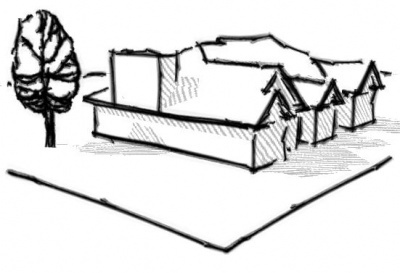 This means that the texture will not rotate to match surfaces, and will not get smaller in the distance. 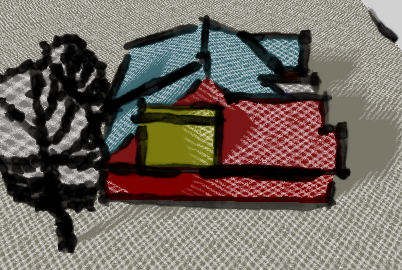 Here is a sample of a Soft Shadow pattern, and a similar Sketchy Shadow material. Soft Shadow Texture Pattern - applied uniformly across image. 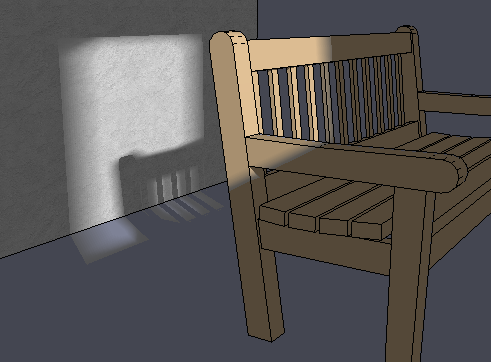 Sketchy Shadow Texture - pattern is applied to model first, and then to shadows. 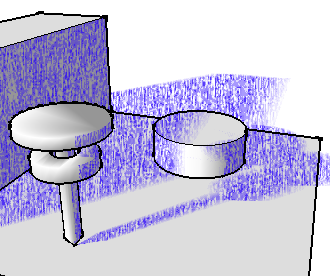 Note that the pattern changes to match the planes of the surfaces in the model, and that the pattern gets smaller as it moves away from the eye. Sometimes when you add a lot of days or time, the soft shadows start to get to wide. You can specify that the soft shadows are restricted to the original shadow shape. 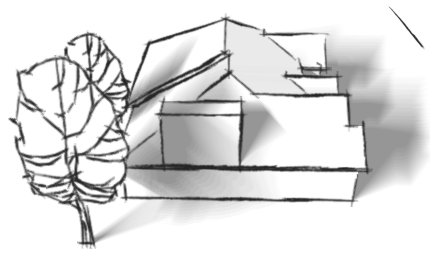 This lets you create very soft shadows in large areas by masking the shadows to the original shadow area. Check Mask to original shadow area to achieve this effect. Soft Shadows masked to original shadow shape. Similar to the idea of masking the Soft Shadow effect to the original shadow area, is the ability to mask it to the original area not in shadows. This works best with interior images. Soft Shadow effect masked to area already lit by the sun. You get a sharp boundary, but a soft effect for the sunlight itself. Set days to 365 and time to 0 for just one image per day. 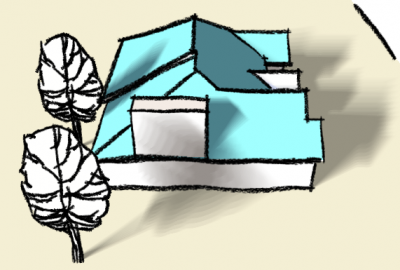 Soft Shadows can also be used with Sketchy Shadows to soften the Sketchy Shadow patterns. Soft Shadows and Sketchy Shadows combined.